$23.99 & FREE Shipping on orders over $59. This bottle tree holds 48 bottles. A bottle tree is a convenient way to store your beer bottles and bottle your beer or wine. Rinse the bottles out well after use and store upside down on the bottle tree where they remain clean. When you want to bottle, use a sanitizing solution, such as Star San or SaniClean, to sanitize your bottles. Wait 1 minute and bottle. You can also do the sanitizing ahead of time and let the bottles air dry upside down. Consider adding the matching sanitizer injector below for a complete bottling package. The injector sits atop the bottle tree and makes sanitizing a breeze! What we at MoreBeer! like about this particular bottle tree is how each section screws together. In most bottle trees the sections are a flush fit which results in a little bit of give or sway when the whole unit is assembled. This bottle tree model is rock solid and feels very secure. 8 bottles per ring, screws together. 2 cases worth of home brew need 48 bottles. And I like how I can order additional rings if I need to sanitize more than 48 bottles. In combination with the sanitizer injector this makes prepping the bottles prior to bottling day a snap.I usually get 60 bottles filled from a six gal ferment. I do 12 to 15 initially and put in a separate rack, then do the 48. Bottle tree sits on the counter next to the bottling bucket. I fill and cap 6 at a time until my 2 and half cases are done. Absolutely perfect. Love it. Works as suggested. Haven’t fill it completely but I have been very close and no problems at all with support or tipping. I have been using this a lot prepping bottle for use, I picked up a few hundred bottle and have been using this for drying them after removing labels and washing. It holds plenty of water dripping from the bottles so there is no mess. I find it very sturdy even when fully loaded with 48 22oz bottles. My only regret was not buying the larger bottle tree when washing more than 48 bottles. I will just buy a second one of these and either use the 2 separate or attach the tree arms to this making it taller. Very useful and durable, this stand is worth its weight in gold if you clean and sanitize bottles with any regularity. Will easily accommodate wine and Belgian size bottles without feeling like it will tip over. 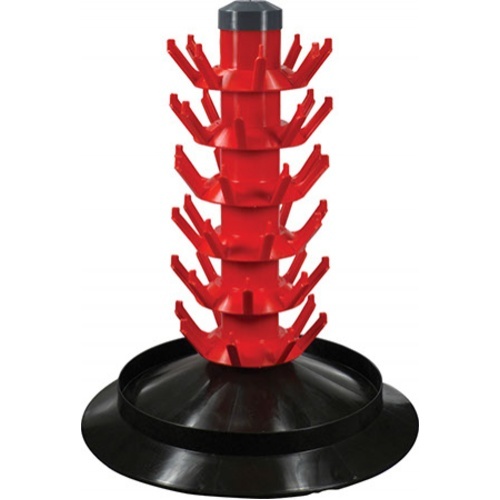 This bottle tree is will accommodate many sizes and weights of bottles without tipping due to the wide stand. Whats really great is the rack rings are screw together rather than the slip fit of cheaply made trees.